The New Powder Room Vanity… Forget the Pedestal Sink! Tired of the pedestal sink often found in standard powder rooms? Why not consider the wide variety of alternative sink options? These include antique pieces of furniture transformed into vanities. There are also many reproduction pieces including a vanity sink. Glass or stone bowls that can sit atop a vanity have recently become popular. At Woodridge Custom Builders LLC, some of our custom homebuyers have scoured antique shops looking for just the right piece to transform into a vanity. Others have designed the powder room vanity around a specific glass bowl. 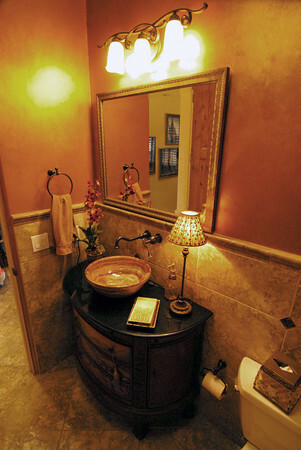 With a bit of imagination a powder room can reflect a custom homebuyer’s personality and chic. Many of these newer style sinks are not expensive yet add a high-end flare to any powder room. The stand-alone furniture vanity shown in photo 1, fit perfectly in the niche designed for the sink. 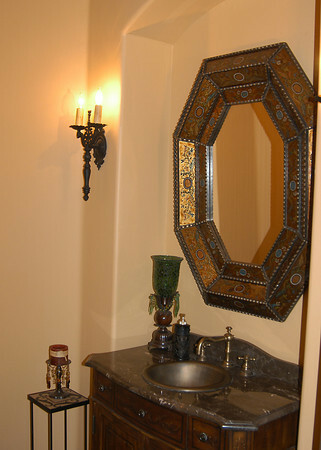 The color and details of the vanity’s base went well in this Spanish Colonial home. 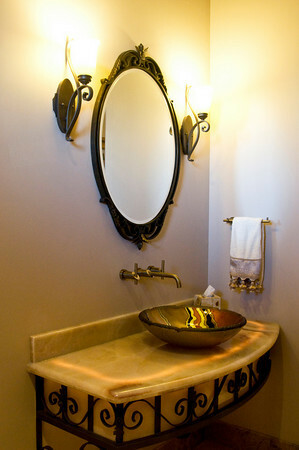 The vanity included a small brass sink and surface-mounted fixtures. The mirror, lighting and accessories enhanced the vanity and created the complete old-world look. In photo 2, these custom homebuyers found a glass bowl they treasured. Finding the stand-alone piece became part of the fun creating the powder room. The vanity is actually a piece of furniture modified to hold the sink. Modified to hold and hide the plumbing fixtures underneath the sink, in some cases, the top drawer becomes unusable, though the bottom drawers remain functional. The additional storage space these stand-alone furniture pieces offer is one of the reasons why customers appreciate these pieces so much, a pedestal sink, on the other hand, offers no additional storage. As both of these photos show, the furniture pieces are larger than a pedestal sink, but offer counter space and under-counter storage, storage always at a premium. The fixtures in this home were installed on the wall to extend over the sink as opposed to the first photo where the fixtures were also installed on the furniture’s deck. These are typical options the custom home buyer makes when creating the desired look. Other trendy vanities include a sink placed on custom-made counter surfaces with wall-mounted fixtures. In this Tuscan style home shown in photo 3, the homeowners had this vanity custom made to hold the glass bowl they had found. The material is strong yet opaque enough to reveal the under-counter lighting. The wrought-iron support system complements the Tuscan style of the home and the wall-mounted fixtures extend over the beautiful glass bowl. For a short video on powder room trends click here… Powder Room Trends YouTube Video. To enlarge the photos below, click on each photo and use the ‘back’ key to return.